As promised when I posted the before and after, here is a tutorial for a simple and contemporary ottoman slipcover. No pleats, ruffles, or tassels! It is an easy project to complete and can give new life to an old piece of furniture. 1. Measure the length and width of the top of the ottoman. Add 1″ to each measurement to allow for 1/2″ seam allowance and cut out of fabric. For example, my ottoman was 26″ wide and 42″ long, so I cut my top piece 27″x43″. If the ottoman is rounded at the corners instead of square as pictured, use a bowl or lid as a guide to cut the corners into a rounded edge. 2. Measure the length and height of the ottoman sides. Add 1″ to the length measurement to allow for 1/2″ seam allowance and 3″ to the height to allow for a hem, and cut out of fabric. 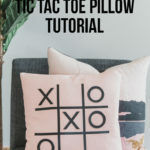 If you have a square ottoman you will have 4 equal pieces, if your ottoman is a rectangle as pictured, you will have 2 pieces of 2 different sizes. 1. Right sides together, pin two side pieces together along their sides. If your ottoman is rectangular, make sure to pin one shorter piece with one longer piece, rather than matching up the two equal pieces. Stitch two pieces together using a 1/2″ seam allowance. You will continue to use a 1/2″ seam allowance for the entire project. If your ottoman is rounded at the top corners as mentioned above, gradually sew from your 1/2″ seam allowance up to a 1″ seam allowance on one end on the last 2-3″ of the seam. Press seam open and topstitch 1/4″ along each side of pressed seam. 2. Pin and sew remaining two side pieces together as you did with the first two. Note: If you sewed the wider seam allowance on one end for a curved top ottoman, make sure to lay the pieces out on the ottoman so that the wider seam allowance ends will all be at the top of the ottoman and not near the hem. This will save you the hassle of seam ripping when you get to step 3 :). 3. You will now have two long pieces for the ottoman sides. Matching up short and long sides again, pin and sew the two pieces right sides together, press seams open, and topstitch 1/4″ along each side of seams. You will now have one long tube of fabric that will be your slipcover sides. 4. Pin slipcover side piece to slipcover top piece, matching up side piece seams with top piece corners. Stitch two pieces together. Press seam open and then toward top piece. Topstitch on top piece, 1/4″ from the seam. 5. 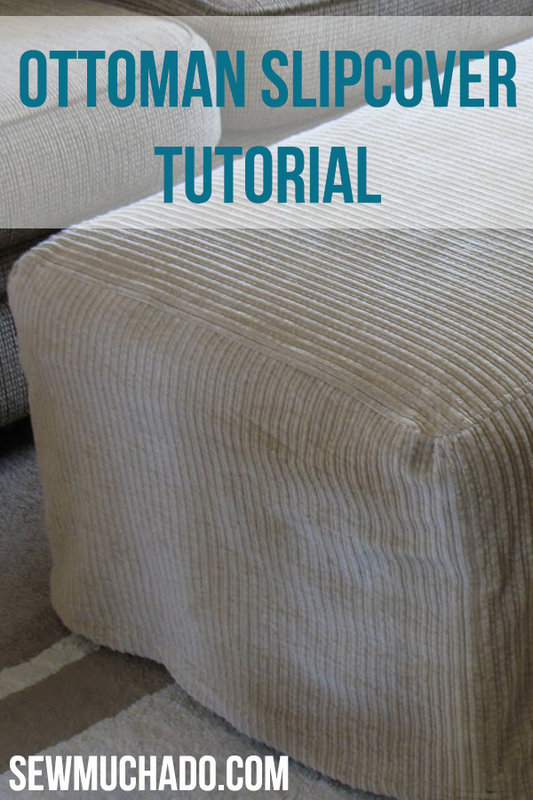 Fit your slipcover over the ottoman to ensure the fit is proper. If you measured correctly, you should have room for a 3″ hem. If you need to make any adjustments to the hem length, now is the time. 6. Fold bottom edge of slipcover 1″ toward wrong side of fabric and press. Fold your pressed edge 2″ more toward wrong side of fabric and press. Stitch close to inner folded edge to form your hem. Stitch again 1/4″ down from the first hem line. 7. Admire your new ottoman slipcover! Nice. Now if only I had an ottoman. Ooooh, nice work. Eventually my ottoman is gonna need this. Abby, this is awesome!! I think I am going to use this tutorial, thanks! This is great, a nice, clean cover and such straightforward directions. Thanks so much for sharing this! I’ll be linking. WONDERFUL! I’ve been thinking about recovering my ottoman. I have a lovely wool blanet from Ireland. Being a new sewer, I just wasn’t sure what to do! Thanks! This is the perfect solution for my kids toy box that sits oh-so-not-prettyly in the living room. I am absolutely doing this TOMORROW! Thank you! Just used your great tutorial to make one of these. Added it to your flickr pool! Thank you SO much for your hard work and for posting this free tutorial! Very good Tutorial, this is perfect in order to improve my creativity, this is excellent actually I think that you can earn a lot of money with this project. I made it and love it! Super easy to follow. Thanks! I’d love to add a picture of mine.